Apparently last night we had a bit of weather. When I am awakened by the rains, it is rather out of the ordinary. The National Weather Service said that we had gotten a rain of 4 inches an hour around 3 in the morning. Total rainfall over 5 inches was most likely, and as always your rainfall will vary. This morning I went outside for the dog walk and found nothing really wrong. There were still large ponds of water waiting to percolate through the sand that we call soil here. It's more like a sieve. People had their mulch wash away and into the street. Wilton Drive was covered with the mulch of many businesses along with the plastic cups from the parties at the bars the night before. There was a tent in front of the bar that served drinks and it had collapsed in the rain and lay there rumpled. For the most part, while the Northeast suffered massive power outages from downed trees we had very little to mention. Once you got off of the island that is the majority of Wilton Manors, the story changed. Many homes were flooded and some cars will be a wreck as a result. Here at arguably one of the highest point on the island, we were high and dry. Later I went out to inspect the damage. One or two new palm fronds got knocked off the tree. My Baker Christmas Moose figure was knocked off of the table by the pool. It didn't even shatter. 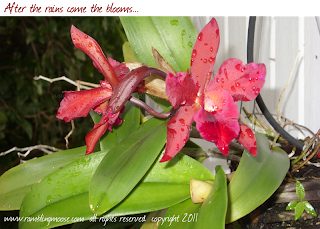 So with Camera in hand I snapped this picture of the Orchids. You see, up North I struggled to get Phalaeonopsis "Moth Orchids" to flower until I discovered one micro-climate window that they liked. Here they grow like weeds. The maroon flowers I have were from a "seedling" we bought in a garden store on discount. House plants that produce beauty simply when tacked to a wall and fed ground water on a drip feed irrigation line. In case you're following this sort of thing, the storm that was Hurricane Rina broke into three pieces. The Low Pressure Cell lost all of its rain. The rain broke into two parts, one went to Belize and had a few drinks on the beach. The other half of the rain went through the Keys and dumped rain there and last night hit here. If you are going to get a hurricane, this is the best way to do it. I'll take five inches of rain and a few blasts of wind over a full category whatever hurricane any day. Nice one !! the picture of orchids is really mesmerizing! !